Whether you are a high school student who dreams of being a healthcare provider or have been a practicing professional for years, you need access to a source for reliable, relevant resources throughout your entire career. At Eastern AHEC, we fill that need. We bridge healthcare and education in eastern NC by being an advanced resource for healthcare providers, from student to expert. Our team of professionals is committed to strengthening healthcare in our 23-county region by tailoring our numerous services to the unique needs of eastern NC. 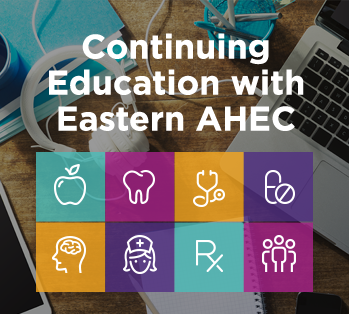 From developing a pipeline of healthcare providers through student services to providing practicing professionals with CE conferences, workshops and symposia, you can find the network you need at Eastern AHEC to ensure a successful career. As an affiliate with the East Carolina University Brody School of Medicine and part of the NC AHEC Program, we have connections and access to many resources across the state. No matter your discipline, take advantage of what Eastern AHEC has to offer, and let us come alongside you throughout your professional life. Reach out to us today to get started.